Our WordPress video plugin just got better! Please note: This plugin is for WordPress developers and requires some advanced knowledge of WordPress to install correctly. 2. Create multiple video galleries on one page. 3. Manually sort order of video galleries on a page. Also, we tidied up some bugs in Chrome. Summary: Select a page, create a gallery and attach it to the page, create a video and attach it to the gallery. 1. Decide which page the gallery will appear in, or create a new one. The video gallery will appear at the bottom of the page content by default. – Enter a name in the Gallery Name field. – Use the Gallery Page dropdown menu to select the page you want the gallery to appear in. – Optional: Write a Gallery Description if you like. By default this content will appear above the video gallery thumbnails. – Unclick Is Live checkbox if you are not immediately publishing the gallery. 5. Now, add a video. 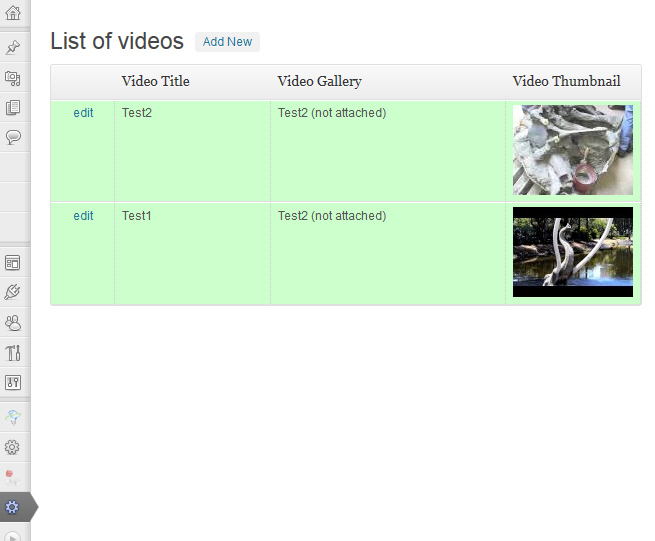 In the WordPress admin UI in the left column, in the Videos subnav, click on Videos. 6. In the List of Videos page, click on Add New. – Use the Video Gallery dropdown menu to select which gallery the video will appear in. – Enter the YouTube or Vimeo video URL in the Video URL field. 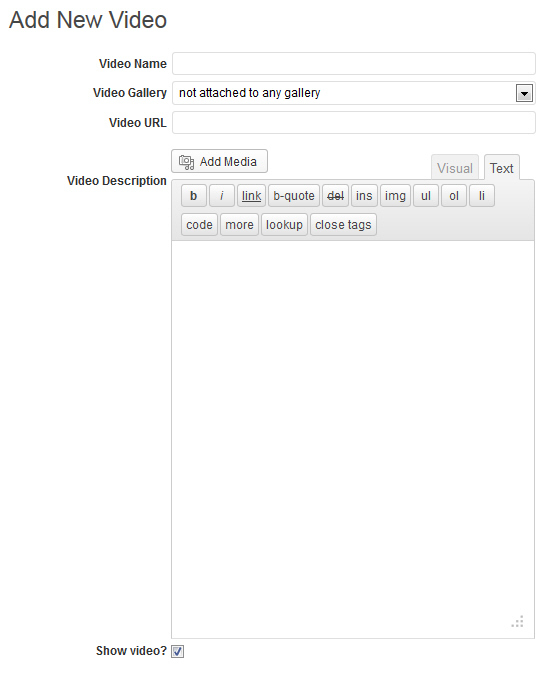 – Optional: Enter a description of the video in the Video Description field. By default, this will appear to the right of the video thumbnail. 8. Make video gallery live. Once you’ve added at least one video to a gallery, you can make it live on the selected page. 9. In the Video subnav, click on Galleries. 10. Find the gallery you want to take live, and click on edit in the left column. 11. Click the Is Live checkbox. 1. In Videos subnav, select the gallery you want to work on. 2. In the List of Videos page, you will see all the videos you added to the gallery in the order they were added. To sort them, use the Up/Down links in the right column. That’s all! 1. In the Videos subnav, click on Galleries. 2. In the Galleries List page, you will see a list of all the galleries. Use the Up/Down links in the Sort column to set the order of the galleries. Although this lists all the galleries in the site, it will set the order of the galleries in a page relative to each other. Upcoming additions: ability to attach galleries to posts, Wistia support. The Workbox team hopes you find this WordPress plugin to be useful. Please send us comments or let us know if you create any groovy enhancements or make useful changes – we’d love your feedback and insights!